Sexism may be a bad thing, but there is actually an example where the existence of sexism contributes to the case for the resurrection of Jesus. Early on the morning of the first Easter Sunday, according to the New Testament, a small number of women came to the tomb where Jesus had been laid, only to find that it was empty. The empty tomb is one of the widely accepted facts that speak in favour of belief in the resurrection of Jesus of Nazareth from the dead. One of the numerous considerations that favour the historical reliability of the account of the empty tomb is the fact that the initial testimony of the empty tomb is said to have come from a small group of women. However chauvinistic it might be, the fact is that in first century Palestine as in the wider Middle East, the testimony of a woman was regarded as inferior to that of a man. If an author had simply invented the discovery of the empty tomb and been trying to make it seem as persuasive as possible, women would certainly not have been his first choice of initial witness. Even in a court of law, women were regarded as being – compared to men – unqualified as witnesses. Presenting the testimony of women as the basis of the belief of others would perhaps have even served as an embarrassment to the early church. Hence, the authors of the Gospel would not have been motivated to paint fictional accounts with women as first witnesses. That they portrayed the events this way therefore counts in favour of the reliability of the account of the empty tomb. But this really misses the point. Nobody ever claimed that the women who discovered the the tomb served as witnesses in a court of law when they informed others of their discovery. That suggestion is so obviously incorrect that it seems ludicrous to raise the response at all. The fact that women were deemed less qualified than men to serve as legal witnesses is relevant simply to illustrate the fact that the eyewitness testimony of women was in general taken less seriously than that of men, and that is the point. While Lowder is correct that in some circumstances the testimony of women would be accepted as a second best solution in court, he does not appear to appreciate the implications of this fact for the empty tomb story. He accepts Moreland’s claim that a woman’s testimony could be accepted “on rare occasions.” He also – approvingly, it seems – quotes Wenham who in turn quotes R. T. Beckwith in noting that “women were allowed to give evidence on matters within their knowledge if there was no male witness available.” In short then, while the testimony of men was clearly preferred and treated as more dependable (unfairly, of course), the testimony of women could be used as something of a last resort if no male witnesses were available. But none of this sets aside the main point here: If the empty tomb story is legendary, one would not expect the author to depict women as those who made the discovery. Let’s consider the fact that a woman’s testimony could be drawn on if the testimony of a man was not available. Now imagine that the first author of the empty tomb story was writing a legendary account. Suppose he was making it up. He has at his disposal all of the better-known followers of Jesus as characters to write into the “discovery account” of the events on Sunday morning. He had available to him John the beloved disciple, James the brother of the Lord, Matthew, Peter, and others. It was clearly not the case that no male witness was available to the author of a legendary account of the empty tomb. A number of not only male witnesses, but highly respected male witnesses who went on to become great figures in the early church, were available to insert into the narrative if the events themselves were fictional. And yet in spite of this, the Gospels depict the initial testimony of the empty tomb as coming from women. The Tomb of Jesus. Oh, and the whole "he was married to Mary" deal. Again. Hume on Induction and Miracles: Having a bob each way? Next Next post: Does John 1:3 rule out uncreated abstract objects? Agree, when we do have potential witnesses in Peter and John, the author mentions that they also find an empty tomb, compare Mary who sees Jesus in the garden—and doesn’t initially recognise him! But of course that same scene from the Princess Bride that you quoted goes back and forth several times. It’s crazy to take the cup in front of me because you want to kill me. So I should take the one in front of you. But you must have known that I would do that, so really I should take the one in front of me. But you’d see that coming, so I should take the one in front of you, and so on. We can extend that into infinity! In general I would think that in a run of the mill court case a judge distinguishes between testimony that sounds natural and testimony that sounds “cooked” in such a way that it’s too perfect. He doesn’t sit there for hours going back and forth saying – but then you must have known that I would say that, so X must have happened. But then you knew I would see this too, so Y must have happened, and so on, tossing up X and Y. Well, the question is who was the legend generator trying to fool? It would be useless to construct a story that was meant to fool people centuries later because it’s lack of appeal in the present would ensure it’s lack of survival. There’s no benefit in a 1st, 2nd, 3rd, etc. century setting to make up female witnesses and had someone taken that gamble in constructing a legend we probably never would have heard of the Gospels in the first place. You’re probably right. Great movie though. I’ll say upfront that I do not believe in the resurrection, and I am undecided on the historicity of the empty tomb. But I do have some questions. Assuming it’s true that women in Jewish society weren’t ideal legal witnesses and that it’s valid to infer the relevance of this to their inferior status as eyewitnesses of events outside of an actual legal setting, I have to ask what reasons do we have to believe this story should be understood in the context of the latter? IOW, what reasons do we have for believing first, that the story should be understood in a Jewish social setting and second, that the function of the women in the narrative is to serve as ‘eyewitness evidence’ instead of having purely literary value? In the two gospels (Luke, John) which do state that their express purpose is history-proving (Luke) or conversion (John), the women wouldn’t have this ‘evidential’ function because the male disciples are inserted into the accounts to corroborate the empty tomb story. (I don’t mean to spam this up, character limitations per post on phone) Afterall, Mark was evidently not trying to convince a hostile or nonbelieving audience, as far as I can tell. There’s a tension in the assumption that the story is cast as eyewitness testimony when the author knew it wouldn’t likely be accepted, but narrates the story anyway. Either way, the story is an embarrassment and fails its purpose as testimony. If he went on to narrate it because it was true despite the women, then the story wouldn’t have functioned to convince anyone. But if it didn’t function to convince anyone, then all the hoopla about the inferior testimony of women is irrelevant as evidence for the truth of the story. Because of the context in which 1) The events were set, and 2) the Gospels were first distributed. On the whole you seem to be saying that the writers – assuming they believed this to be the most important sequence of events in human history – wouldn’t have narrated these events unless they thought that the message would generally be accepted. Firstly I don’t know how much I buy that. Regardless of how big the uptake, if these events are as important as the writers believed, of course they would record them. Besides, that they wanted the message to be accepted and yet they still depicted women as the initial witnesses suggests that they weren’t willing to lie to make their story more accepted. Secondly there’s no really good reason to think that the Gospels were not recorded for any evangelistic purpose. You don’t really explain why you suggest this. You note that Luke and John state that their purpose is to convert or persuade, but am I to think then that you are arguing from silence in regard to the other Gospels? That because they did not add this line, they therefore didn’t envision people being persuaded because of what they wrote? I guess I just see no value in that argument from silence. You say “the story is an embarrassment and fails its purpose as testimony,” but this is the very premise I undercut with this blog entry. The embarrassing feature is part of what suggests authenticity, both to us and to the first reader. Thanks, Glenn. But I’m not satisfied with those answers. The events in the story take place in a Jewish context, sure, but this doesn’t carry over to the setting in which the account was composed, or, IOW, how it functioned for those for whom it was intended. So as for the your point #2, what evidence is there that Mark was distributed in a Jewish setting, i.e., for Jews who would be socially aware of the inferiority of female testimony? If Mark was written for gentile Christians, for example, the account could have conceivably been fabricated without any scrupling over whether it would stand up to Jewish social sensitivities…because that would be irrelevant. If it is irrelevant, using women is no embarrassment, and it follows that appealing to the inferior testimony of women among Jews is no argument for the historicity of the story. Eric, obviously there could never have been an expectation that the story would never ever be presented in a non-Jewish setting. Nobody would say that. But the fact that it was created in a Jewish setting remains significant for the reason outlined in this blog post. That was the first audience. Or are you willing to say (and preferably argue) that all the accounts in which women were important witnesses – the first witnesses – were primarily written for a Gentile audience? You’re welcome to of course, but you’ll need to be willing to argue for it. (last comment posted prematurely on accident) The spin you’re asking me to accept is that the author wants to convince his readers of the truth of the story by telling an embarrassing fact–a fact the readers would have consciously understood to be something no one would make up and so consequently have been forced to believe. This is claiming more than you can actually hope to prove, and I would say you’re imposing your own perspective of the text on the original readers…and this is all ASSUMING that the original readers are these supposed Jews who were sensitive to such things as the inferior testimony of women. No. Eric, nobody would ever say that the inclusion of women as the first witnesses is an embarrassing fact that proves that the accounts are true. That’s a far too ambitions claim. My only contention is that it counts in favour of the authenticity of the accounts. Proof of the Jewish audience of Mark, John and especially Matthew would be the profusion of what new testament scholars refer to as “semitisms” throughout the text. I’m confused. I thought Glenn’s point was that the inclusion of the “embarrrassing fact” was evidence that the author didn’t feel at liberty to adjust the story to suit his motives. The author didn’t include the fact “to convince his readers” but because he considered it to be an important part of the history he was documenting, regardless of how “embarrassing”. Glenn, I’m only alluding to the possibility that Mark was written to gentile Christians (possibly Rome, as many scholars propose Latinisms and patristic tradition suggest.) The author presupposes his audience is unfamiliar with Jewish customs (Mk 3.3f.) and places words in Jesus’s mouth about women initiating divorce which isn’t consistent with Palestinian Jewish traditions (Mk 10.12.) Because of this, you can’t just assume his women at the tomb story should be understood against a Jewish male-dominated social backdrop as an argument for the story’s authenticity by virtue of an ’embarassment’ such a story with women would have caused. (really gate this phone) Glenn, also, that the story couldn’t have ‘ever’ been expected to fall into the hands of Palestinian Jews who would slight the women as witnesses is a red herring. I can’t expect that my comments on this blog will ‘never’ be read by my conservative Christian mother, but how she feels about my views here has nothing to do with why I composed them. You don’t have to appeal to the women as ‘proof’ of the historicity of the story. My objections apply even if you’re using this argument just to ‘count in favor’ of its historicity. Glenn, I’m not just calling into question the setting of the story’s composition, but also the notion that the women are even being portrayed as ‘witnesses’ to the event in order to convince anyone. This needs to be proven from Mark, not assumed, regardless of who the story was written to. If the testimony of the women is irrelevant to why Mark depicts them as the discoverers, then their presence can’t be used as an argument in any sense for the story’s historicity. The autograph of Mark was written in Greek and disseminated throughout the roman empire but this is obviously not the original source. Any explanation about Jewish customs can be explained by positing a redactor who committed the story to writing for a wider audience. An analysis of the Greek text of Mark reveals a redactor with a poor, non-native compression of the Greek language. @Mike: The presence of Semitisms would reflect only on the author’s (or his source’s) linguistic and social background, not the audience’s, would it not? @Collin: Glenn did say above: ‘The embarrassing feature is part of what suggests authenticity, both to us AND TO THE FIRST READER’ (emphasis added.) I took this as indicating that despite the ’embarrassing’ feature of the women, the first readers (Glen seems to be positing they are Palestinian Jews) would have consciously rejected the notion that Mark would have made it up and thus would have been compelled to entertain the story’s authenticity, which is why Mark ‘honestly’ included them in the story. Eric, I think it is a modest assumption that the author of a work crafts it to suit his audience. It’s not a leap or a tenuous claim. So it’s fair for Mike to note the presence of Semitisms in the work as a clue that the audience was expected to be one that would read such things. Also, I note that the only person to have used the phrase “Palestinian Jews” is you. You’ve used it a few times, and may have somehow gotten the impression that I too had used it, but I haven’t. Not all Jews were Palestinian, and Jewish faith, culture and Scripture certainly extended beyond the borders of the land of Israel. There are certain arguments, like those of Craig, that the empty tomb narrative is primitive. Yet he considers the empty tomb narrative to have been part of the pre-Markan passion source. But the passion narrative is adorned with high theological and scriptural motifs, the very thing it is argued is lacking in the empty tomb story as a pointer to its primitive witness. That’s an outright inconsistency. If the empty tomb story was so ancient and important as the impetus for the movement, certainly it would have received the same theological/scriptural elaboration before, if not along with, the passion source it’s supposedly a part of. This is more explicable, I think, if it postdates it as a creation of Mark, not if it predates it. The women aren’t mentioned in 1Cor15, which is also supposed to be early and a summary of what the Jerusalem apostles were preaching. But the absence of the women there is explained by the same social argument about their inferiority that is used in favor of the authenticity of their presence in the equally primitive (so it’s alleged) empty tomb account which in turn is supposed to come from the same circle of apostilic witnesses who were so honest about it, they included the mention of the women. Then there is the women’s silence to explain (it must be concluded it was intentionally omitted in subsequent gospels assuming the consensus two-source theory.) I think this is best accounted for by the hypothesis that the story was novel. There seems to be one prevailing apologetic explanation: That the women stayed silent only on the way to tell the disciples (a very short time, thus their reticence is hardly worth mentioning); they must have spoken up at one point or another or else there’d be no story to tell. But this is blatant question-begging for the historicity of the story against the legend hypothesis and ignores the possibility that Mark is assuming narrator’s omniscience. Also, the women’s silence clearly stands intentionally in direct contrast to the angel’s command to tell the disciples. The obvious conclusion is that they did not tell the disciples…not a very short time later, or in the whole course of whatever story Mark’s narrative was supposed to end with. eric, are you quoting from someone else? How about you unpack that in your own words, and we can discuss that. No, Glenn, those are my own words. Why wouldn’t they be? Anyway, see for example the several scriptural citations backing up points in the narrative, curtain of the debir ripping, Roman soldier exclaiming the son-of-Godship of Jesus, etc. Just so you know Glenn, I’m really only asking questions and demurring against certain points made here because I’ve obviously thought somewhat on this issue before and have read a few things. I don’t have the ‘expertise’ in any of the ancient sources relevant to the period nor any knowledge of the relevant ancient languages, I was just roaming the interwebs and thought this might be a good place where I might get some discussion. I only found your blog through a link on ‘adhocpodcast’ and this entry looked interesting. @Glenn, my friend, what do you think of the suggestion that the women are advantageous literarily speaking for the drama Mark was trying to convey in the sense that the fact that they are women made their role as marginal, unwitting spectators all the more effective in preparing the reader for the climactic event of the resurrected Jesus leaving an empty tomb behind? Viewed this way, they are far from an ’embarrassment’. They’re subordinate literary tools, not a focal testimonial basis to the story. Gary, when you’re the first to come up with a theory (or you think it’s obvious but everyone else has missed it), that’s a good reason to check again. Just do a quick check (I can see you’ve done none yet), and you’ll see the day begins at sunset in Jewish reckoning. Crucified before sunset, guard placed after sunset. Nothing to see here. But note: That has nothing to do with the subject of this blog post. I’d suggest writing your own blog post on this preferred subject of yours, thanks. Respect the purpose of this one. Let’s keep things on topic. Even if the Sanhedrin came to Pilate at one minute past sunset, that still leaves a period of time that the tomb was unguarded and unsealed. Even if it was just 10 minutes, that is plenty of time for a group of people (grave robbers, the disciples, the family of Jesus) to move the stone, grab the body, and disappear into the darkness. If you say that (probably) the Sanhedrin left guards at the tomb while they went to see Pilate, then you have to ask yourself, why would they even bother Pilate for guards when they could supply their own? Bottomline: the most likely explanation for the empty tomb was someone took the body during that interval between Joseph of Arimethea rolling the stone in front of the door of the tomb and the Sanhedrin going (the next day) to Pilate to obtain guards. I believe that this statement in the Gospel of Matthew puts a gigantic hole in the principle “evidence” used by many Christian apologists, especially William Lane Craig, that the best explanation for an empty tomb, which was guarded by Roman guards, was a supernatural resurrection. Thanks, Gary, for at least implicitly (I think) agreeing that your initial stance of – wow, a day later! – was wrong. OK, now, back on track – women as first witnesses. So, back on track…the women at the tomb. I personally believe, as does Bart Ehrman, that this detail has a high probability of having some truth to it for the reasons you list. So why would the story have women showing up to the tomb as the first witnesses to the Resurrection unless women were the first to see the empty tomb? 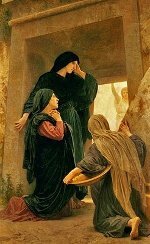 Back to the story: So the women show up Sunday morning and find the stone rolled away and the tomb empty. What happened? The new shift officer orders his guards to break the seal and look inside the tomb to verify the body is still there. They do so and find the tomb…empty! Terrified that they will be punished for letting someone take the body, they flee the tomb. The next morning the women show up, see the stone rolled away, and find the tomb empty. The rest of the details in Matthew, such as earthquakes, angels, the burial shroud neatly folded and laid to the side, are legendary embellishments to the story. “It didn’t happen like that!” you will say. And I will say, that this hypothetical explanation is much, much, much more probable to have been what happened than that a dead man walked out of his tomb to eat a broiled fish lunch with his former fishing buddies, to later levitate from a mountain into outer space. Glen I would like to apologise for derailing the purpose of this post. If the guards were sent to secure the tomb is it likely that they didn’t check that his body was stolen considering the fact that the main reason why they were sent to guard the tomb in the first place was fear that his body would be stolen by his disciples? Furthermore, this plan would also have to include other people outside the circle of the disciples since such an “impossible” occurrence as a resurrection would be more convincing if others who were not biased followers of Jesus said that they saw Jesus after the crucifixion. This means that the disciples would have to convince a lot of people to go against the Jewish religious leaders, thereby risking their own economic and social security, as well as risk bringing conflict into the region since the Jews who sent Jesus to the cross could easily persecute these new apparent converts. Additionally, this would bring further attention of the Romans to the issue thereby escalating tension which was not something the Jewish people wanted. How would it explain Jesus appearances to skeptics like James and Paul? Unfortunately, following this comment, gary began to flood the thread with scores of comments, published one after the other. He’s gone away for now. It would seem I was partly to blame for that derailment Dr Peoples I was actually thinking of responding to him but I didn’t have the time to do it. I had the answer all prepared in my head lol.